I have enjoyed gardening for at least 30 years and enjoy sharing my experience with others. Gardening is my time to meditate and unwind. Asiatic lilies are some of the most beautiful flowers that you can grow. I love to walk in the garden and see the new blooms, and my garden just wouldn't be complete without them. These are my favorite flowers next to daylilies (which aren’t really lilies at all). Here you will find all the information you need to grow Asiatic lilies. Once you plant lily bulbs or plants, they will give you pleasure for years to come and multiply and become even more beautiful. 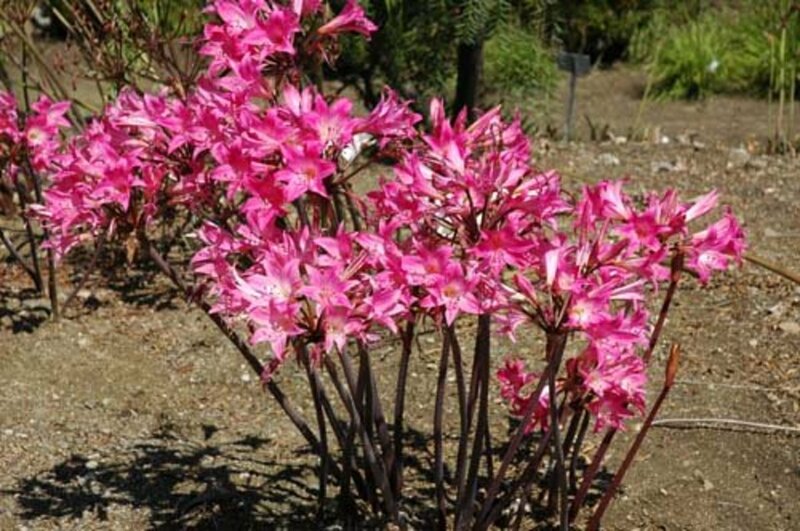 They are grown from a hardy bulb that multiplies quickly and takes little care. They come in many sizes, heights, and shapes. Lilies are called bulbs but are really tubers with fleshy scales that never go into dormancy like other bulbs that you might be familiar with. The Asiatic bulbs are the first to bloom and come in a large variety of colors. Different varieties will bloom at slightly different times. Many types are available, but always check that they are hardy in your planting zones. Some lilies aren’t hardy in the north, and some can’t be grown in the deep south. Never buy bulbs that have been marked down for clearance in the stores. These are usually completely dried out. Buy good, fresh bulbs. If the bulbs are too dry, they won't even sprout. The bulbs can be planted in either spring or fall. In the fall, they can be planted until the soil freezes. 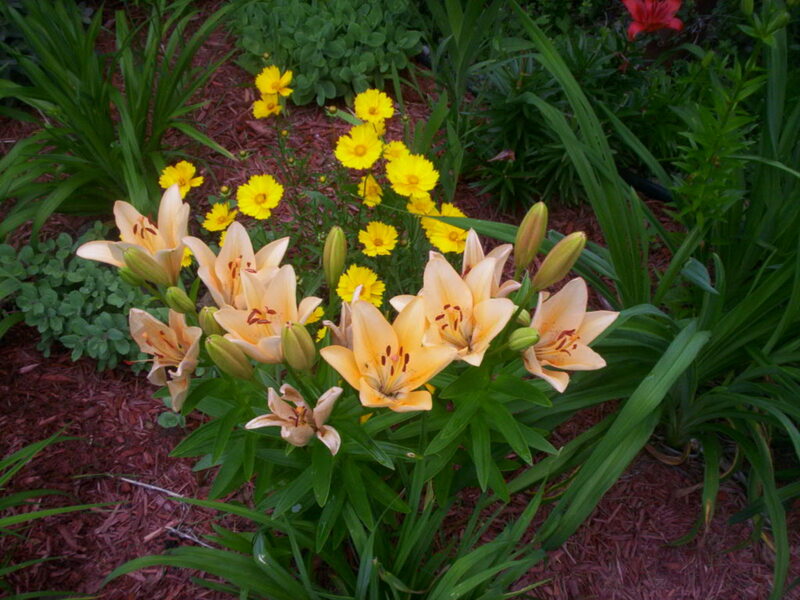 Lilies can be planted in full sun or partial shade in a place that has good drainage. At least six hours of sunlight a day is preferable. A spot where the lilies get morning or late afternoon sun is best. Lilies will thrive in the shade, and I have grown them in shady areas. But you are taking a chance that they may not bloom well there, and the plant is usually shorter. In the shade, they also have a tendency to lean towards the sun. I have several that I need to move to a sunnier area since they are leaning almost to the ground. The bulbs should be planted as soon as possible, because they dry out easily. 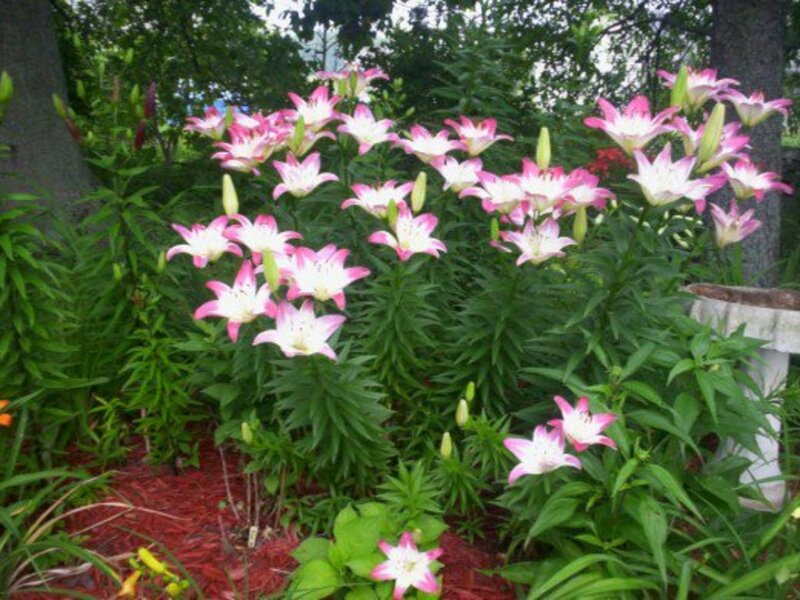 For a nice looking stand of lilies, it usually takes three or more tubers. These will multiply, and eventually you will have a really nice grouping. Plant them among other flowers that will shade the bulbs. Check the bag that the lilies were purchased in for planting depth. Something nice to have, but not necessary, is a bulb planter. You just press it into the ground and it will make a hole at just the right depth. Fertilize your plants with a slow-release food in the early spring. 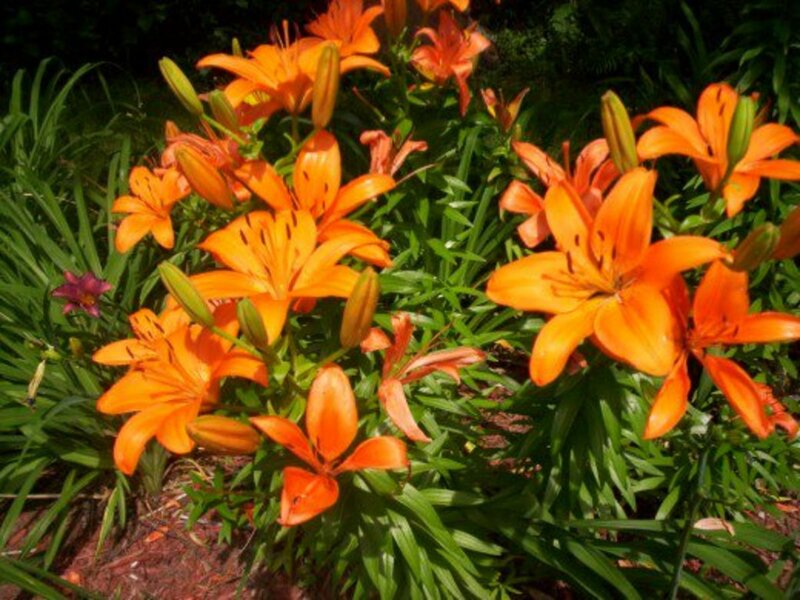 Use a fertilizer that is recommended for lilies. Check the back of the bags and it will tell you how much to apply to each plant. Lilies need at least 1” of water per week. 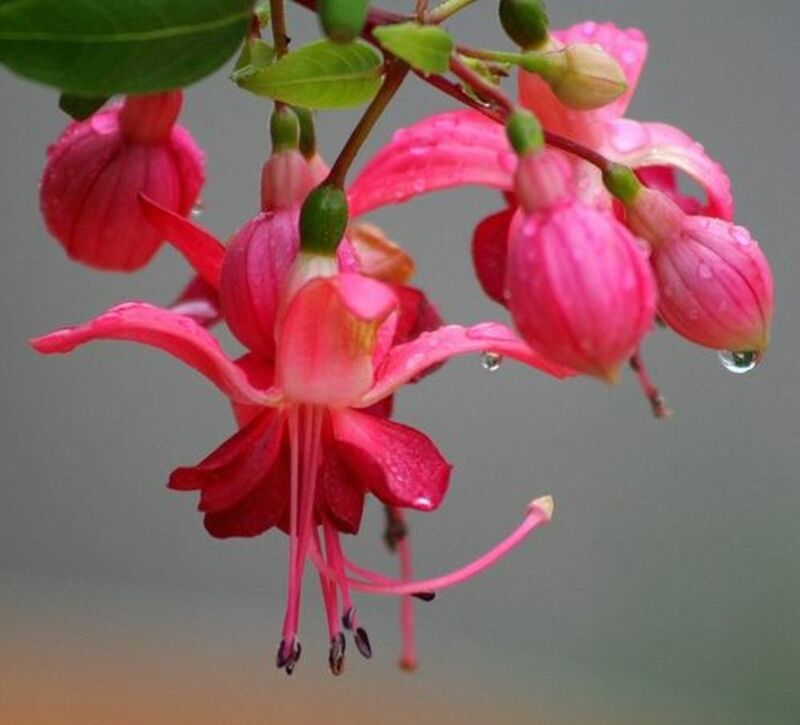 Try not to get the leaves or flowers wet when watering, since this can cause disease. Deadhead the flowers as they start dropping their petals, and don’t allow them to go to seed. Leave the green plants until they turn brown, as this helps feed the bulbs. After the stalks have turned brown, mulch the plants in late fall to help protect them for the winter. 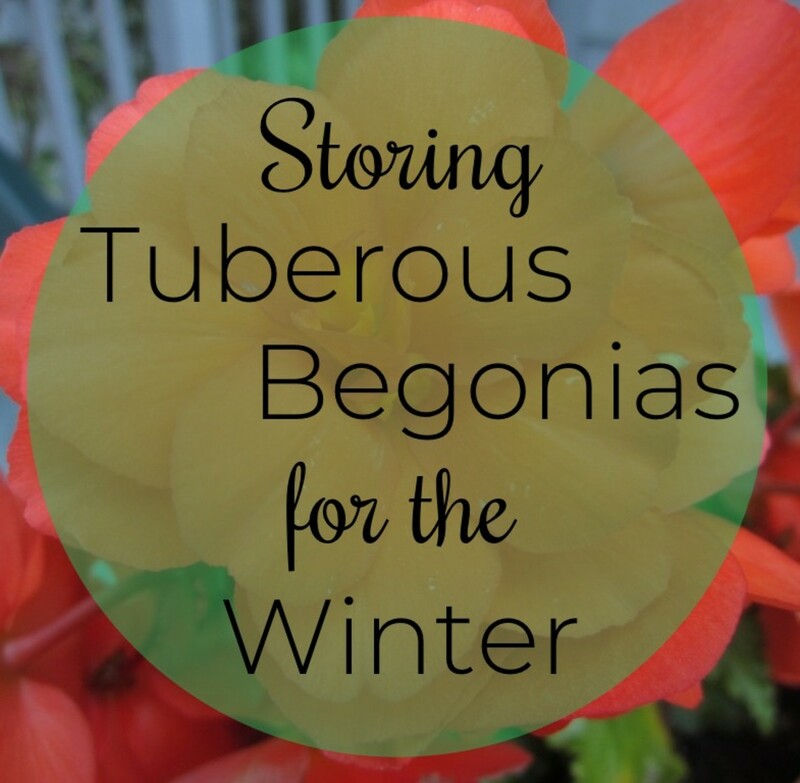 This usually isn’t necessary unless you live in a very cold zone, but it will be beneficial to the plant. If your Asiatics start bloom less frequently, it is probably time to divide the bulbs. The bulbs multiply quickly, and the baby bulbs will drain nutrients and water from the main bulbs. Be careful not to slice into your bulbs when digging, though. Now you can use the baby bulbs for new lily plants. Remove the largest bulbs first, and plant at least three of these together. The tiny bulbs can all be planted in a spot together for storage until they get large enough to display in the garden. My granddaughter and I tried our own hand at hybridizing Asiatics. She was just a little girl at the time, and we had a lot of fun. All you need is to take the pollen from one bloom and dab it into another. You'll have no problem getting the pollen out of the bloom. 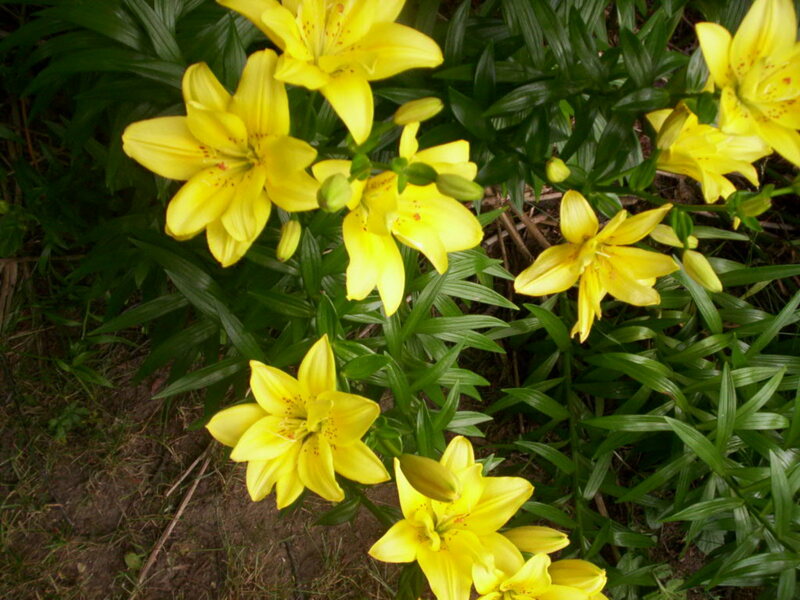 Lilies have so much pollen that the yellow will get onto your clothing if you aren't careful. If you want to keep track of which plant you hybridized with another variety, you should place a plastic bag over the bloom when you are finished. This will help bees, wind, or other insects from spreading pollen from another bloom. You can end up with some new colors and fun blooms. Once the seeds are ripe, you'll need to pick them. Plant them in the garden the next year. The little plants look like spikes of grass. You'll need to mark where they are planted, so you don't accidentally pull them out as weeds. The plants will take about three years before you'll see blooms. This takes patience. If you have any problems growing these beautiful flowered vines, be sure to read the tips for planting and growing them. If you enjoy Asiatic lilies, you love these beauties just as much. 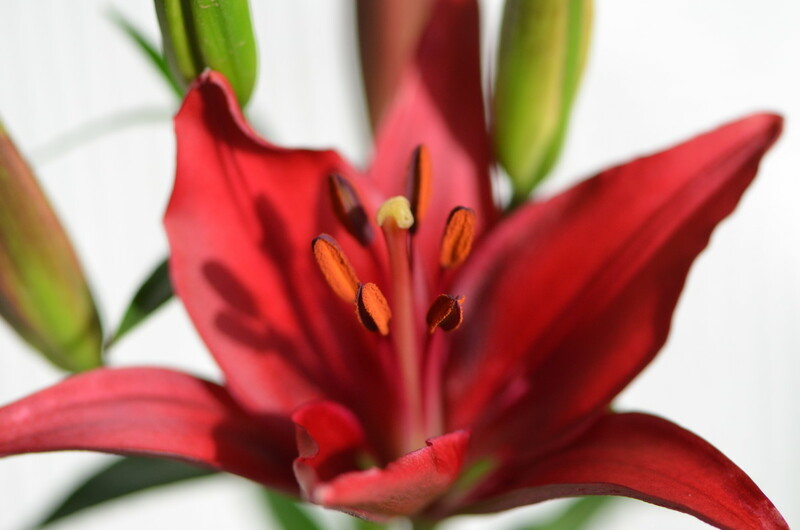 Orientals bloom when the other lilies are finished. Be sure to include them in your garden. Many Asiatics are hardy in Zone 3; the bulbs don't go into dormancy like many other bulbs. Even though, they will survive the winter in most zones. Something is eating holes in my lily buds. Do you know what it is, and what I can do? I can't say for sure without seeing the culprit. It sounds to me like Japanese beetles or lily beetles. The trouble is that it could be many different insects, and all I can do without seeing them is guess. Once the petals of Asiatic lilies fall off, do they come back again; or is it just the one bloom? Asiatic lilies are ready for the winter when the petals fall off and the plant has turned brown. After that, they won't bloom again until next year. 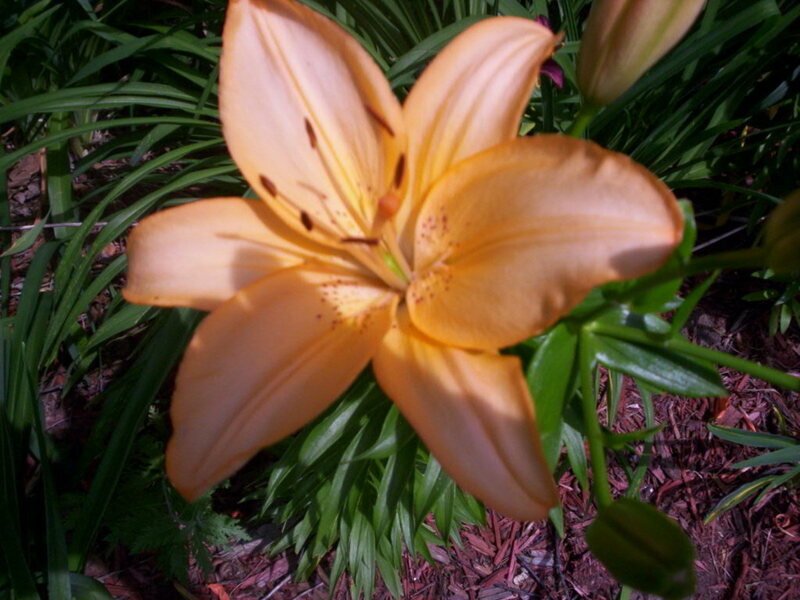 Do Asiatic lilies bloom all summer? A bloom can last two weeks, but more buds will open. No, they don't bloom all summer, but with proper care, you can get them to rebloom at the end of the summer. Remove the stalks of the faded blooms when the bloom dies. Keep all seed pods removed. If your season is long enough, you can get rebloom. How do I protect a White Sunny Azore Oriental Lily during the winter in Chicago, IL? Most Orientals are hardy in your area. I tried to research the variety that you mentioned but came up with nothing. 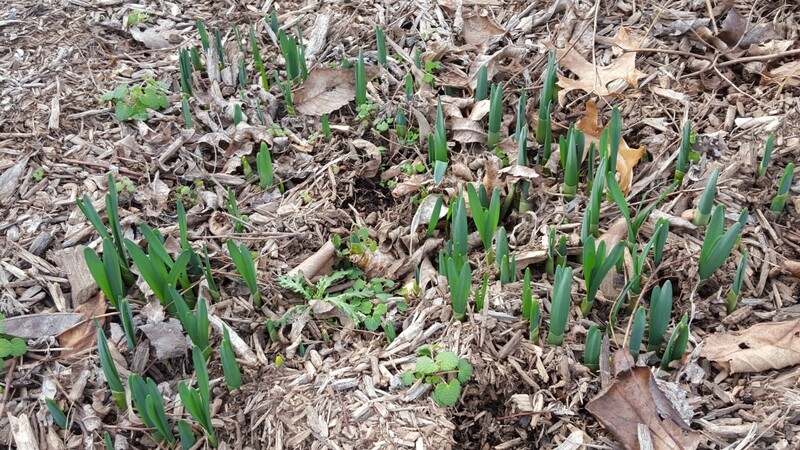 Cover the leaves and check during snow melts that the bulbs haven't been pushed out of the ground. How do you plant Asiatic lilies? Using a bulb planter is the easiest way. If you do not have one, bury them 5 to 6 inches deep. Can Asiatic lilies be grown in pots? Asiatics can be grown in pots, but they should be planted outdoors after blooming. I tried to over-winter them in pots in Zone 5, and the bulbs froze. 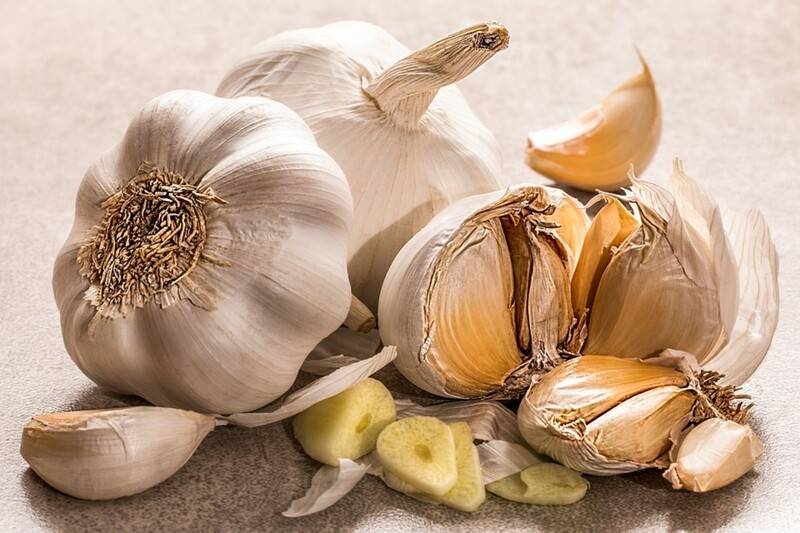 If you live in a warmer climate, you may be able to keep them in pots, but the bulbs do multiply over time, so you need a big pot if it is a large mature bulb. 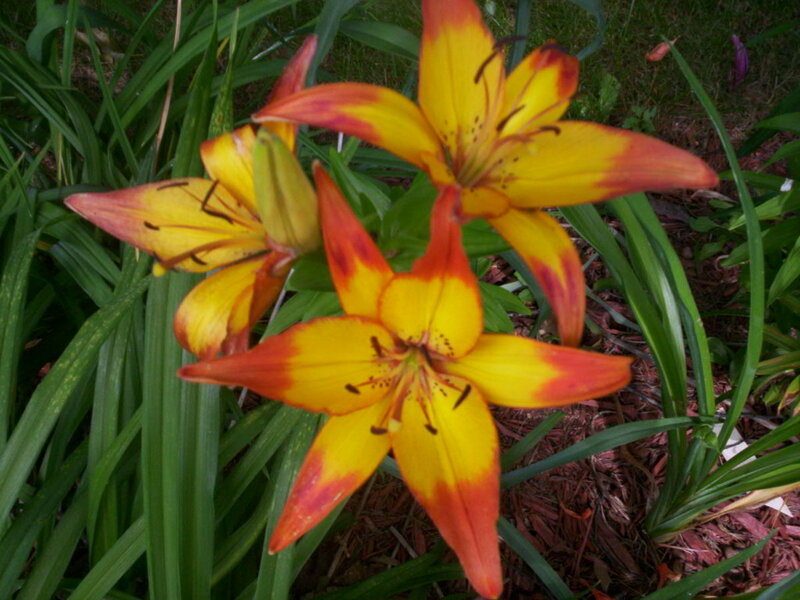 Do Asiatic lilies attract bees and mosquitoes? Asiatics are fragrant and do attract bees, but not mosquitoes. I have 3 yellow Asiatic lilies that I had in a pot last year and planted in the ground last fall. This year there are many pretty leaves, and what I thought were flower pods. No flowers have bloomed, the pods just turn yellow and fall off. They are planted in an area where they get about 6 hours sun per day. Any suggestions? I am in zone 8. The only answers that I can find is that too wet conditions can cause this. Also animals eating the buds if they are gone. I would think conditions that are too dry could cause this also. I've never had this experience myself. 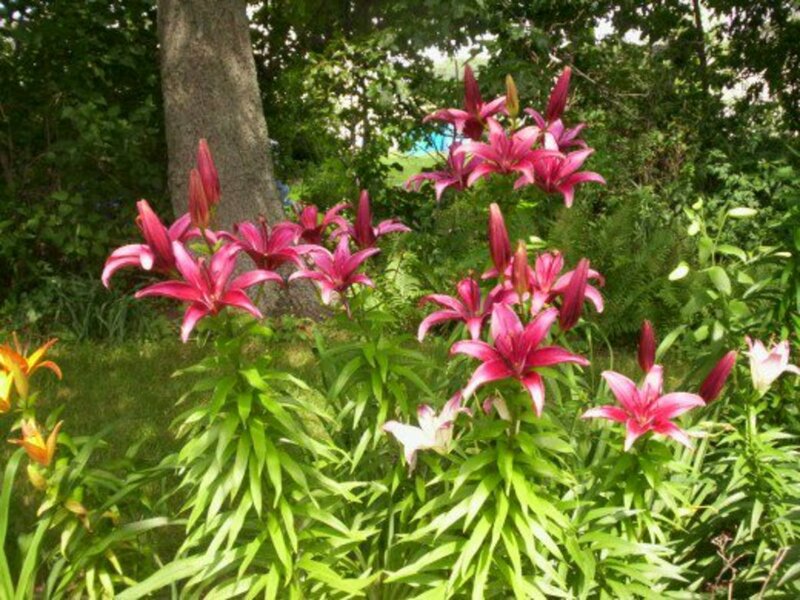 Are asiatic lilies deer resistant? My research says that deer love the buds and blooms. I've just had my first experience with deer in the garden yesterday. Two cute little fawn thought they found a salad bar. My dog scared them off. Try deer repellent. That is the only solution I have other than getting your own dog. I usually plant mine in the ground. You can grow them in a pot, but I wouldn't overwinter them this way. Depending on the size of the pot, you can plant as many as three. After blooming, you should plant them outside in the ground. I just got some asiatic lilies. I have 10 bulbs.. Do you plant more than one bulb in a pot or just one. The directions show just one. They are multiple colors. What are the black things that grow out from the stalk after flowering? Your weather is so different than mine, that I hesitate to say. What I would do is wait until the plant turns brown like yours then cut it down. Leave it in the soil and it will come back. I am not sure what growing zone you are considered and if this is a perennial bulb in your area. Try this and if all goes well it will return and bloom again. Hi there, I live in the Caribbean and I bought a potted, it looks similar to the purple one in your post, I definitely do not have a green thumb, but it I am just seeing a sole bloom after the others fell off and now it's turning brown, should I cut it off once it dries? will it grow back? I have been monitoring the soil, it's not dry, but it's not damp either. No, they will not bloom until fall. In Oregon, they may bloom twice, but once they are finished blooming that is it. I would take the bulbs out of the pots and replant them in the ground if possible. Thanks Judy for reading the hub. I bought 3 potted asiatic lilies recently, and each pot had 3 stems. The blooms were beautiful, but now they are gone. The plant info indicates they will bloom until fall, but I don't see any new buds. I live in southern Oregon. Are they finished blooming for the season?? Yes, Asiatics grow fine in zone 9. Asiatics only bloom for a couple of weeks, but will bloom more than once in Florida. These are easy plants and I am sure you will be pleased with them. Hi I live in Ocala Fl zone 9. And just purchased some orange and yellow Asiatic lilies. Will these grow here? And how long will they flower? My asiatic lily bloomed in the spring, but I have not had any bloom since then. I have watered about very other day, but never used a large amount of water. Some of the leaves are turning brown. Any advice? Thanks! Pat, The bulb does stay alive in the ground as long as no animal eats it. Here in the north, the plant won't grow back until the next year. If you live in a warmer zone, it may for you. I hope this helps. I bought some nice plants this year. They were doing great. I had them all "caged" to keep the rabbits out. Well, one cage was knocked over (probably a jack rabbit) and the plant eaten to the ground. Will my plant recover? Should I leave it alone for now? Water it? I hope not to lose it. The only cause I can think of is that you started out with small bulbs. If you live in a very cold climate, they could be freezing off. Here in Zone 5, they are blooming now on June 16. My asiatic lillies, second growth year, are getting very tall but have no blooms. What do I do? Juanita, Yes I cut them down once they are entirely brown. The bulbs will continue to live through the winter in dormancy. If you don't live in a northern state, they may just pop back up and bloom during the winter. I am not sure if you have Asiatic lilies, because you state that they bloom for months. Asiatics only bloom for about a month and then stop. Later on they may put on more blooms if the temperatures are warm enough. Thanks for reading the hub and I hope that I have helped. I have read all of the above postings, and yet I have just one question. We moved into our home and found many of these lilies planted in the back yard. My question is: Once the plants have turned brown (after many months of blooming) do I cut them off at the ground, or what? I see where I am to mulch them, but after they are cut down? JV, Is the soil soggy that you intend to plant it in or does the water lay on the soil? Then the spot may not work and it may be too . Otherwise it should be fine. Each bulb should be planted separately unless they are tiny. Asiatic lilies are always making new babies and let the tiny bulbs on, but separate the larger ones. After several years, you may need to divide them, since they do reproduce. Once they are blooming as well as they once did, do this. If it is in front of the house, the soil isn't probably the best. I would purchase some good gardening soil to plant them in. If you have any other questions, be sure to ask. I hope this has helped. Hello. I live in Colorado and I just bought a pot of Asiatic matrix orange lilies from Home Depot. I'm new to gardening so I have few questions. I want to plant them in front of my house where it gets at least 8 hrs of sun and I've read that I should plant them in an area with well drained soil. How do I know that it's well drained? My sprinklers turn on once a day for 10 minutes, do you think that'll be too much water? Also, when I plant them, do I need to separate them or can I just take the whole plant out of the pot and dump the whole plant in the hole? Do I also need to use gardening soil or compost? It's not on a raise bed , just in front of my house with the other bushes. Thank you! Margaret, Dividing is almost you have to do for those beautiful blooms. Fertilizing will get you more blooms though. Thanks for commenting. justmissjamey, Asiatic lilies aren't picky. It would help to give them a little fertilizer once in a while. They are easy plants to grow. Your location sounds fine. Have fun! THANK YOU SO VERY MUCH for the help, and advice. I will get them in the ground this weekend then!! I would be excited to find an extra bulb in there. Do you think they would do well planted on the south side of my house?? It gets pretty much full sun there, and the only thing that is close to it, is a house next door. Plus I was thinking of maybe planting them closer to the brick foundation of my house. Would that be okay?? I have read that some plants can be kind of picky about things, and not sure if these are one of them. Also, when I plant them, should I mulch them, or just leave them be?? Sorry I am asking so many questions. Your pictures are so very beautiful and I can't wait until I have them a couple years in the ground (happy thoughts) and then try to rub the yellow centers together. I'm amazed that's all you have to do in hopes to get a new color. These little flowers seem so pretty and fun, I just hope they turn out to be fairly easy to grow and keep alive!! justmissjamey, My lilies in the garden are all up, but not tall yet. Yes, I'd get them planted. Since they are all different colors, I'd plant them a bit apart and let them spread. You are suppose to divide them every 3 to 5 years, because they do make baby bulbs. The babies will take nutrients from your main plant. You can replant the babies and you will get more lilies. I try to put 3 together to make a statement. Not all 3 bulbs in the same hole, but close together. It is up to you if you want to do that are not since they are different colors. You may find that your pots have more then one bulb in them. I've found 3 in a pot at times. justmissjamey, I can't give you a lot of info unless I know what they are. 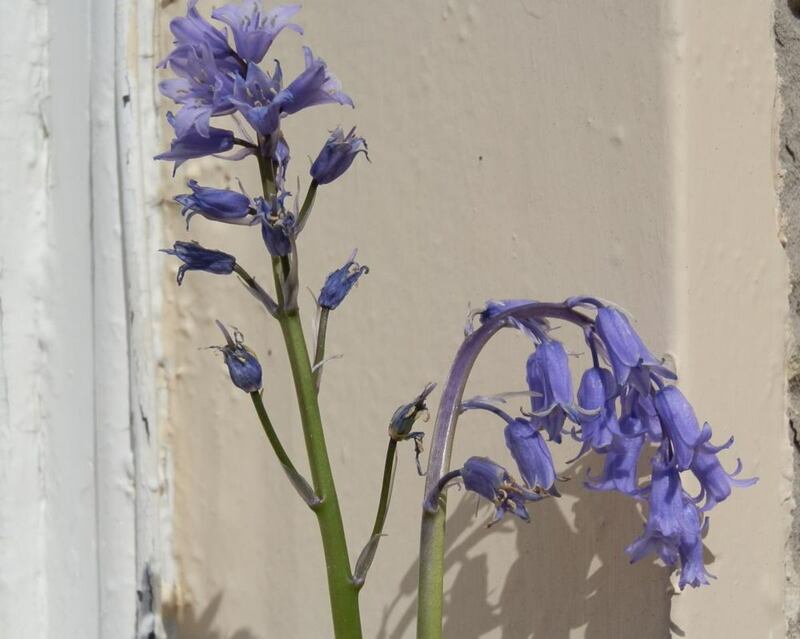 It sounds like they may be hyacinths if they are blooming in Zone 5 right now or look up spring bulbs for Zone 5. Look up those and let me know if that is what they are and I'll give you more information. Most flowers that are blooming right now are probably spring bulbs and most do spread. Most gardeners say to plant in groups of three for a good show, so I wouldn't plant them too far apart. You can always divide bulbs in the fall if they are planted too close together. Let me know if you find out what they are and I'll give you more information. When i plant them, eventually in a few years will each plant turn into more then just the one main stem, or for the most part will they get a few stems per plant and get the flowers on it?? I think i am kind of confused because i keep reading about bulbs and mine came as already plants, so i am assuming that they were a bulb. (can you tell i am not sure what i am doing? lol) i am trying to figure out in a couple years how wide they can spread and how close should i group the three i have bought together. I would really like for them to spread out, but from looking at your pretty pictures, i am guessing they don't "bush" out, but mostly will keep to a stem versus turing into a small bush, or rather a clump, Is that right?? Also, i am in central indiana (zone 5) and was thinking of planting them on the south side of my house, kind of close to the house. Do you think that would be okay for them?? I have read on here that they like mulch, since i will be planting them this weekend (april 26th or 27th) that i should cover with mulch right away, or should i wait until early fall to add mulch around them?? And they stay in ground all winter correct?? I know i have recently bought some bulbs glads or something that says they need to be pulled up in fall and stored for the winter, i am not sure if i need to do that with these as it didn't really have much info on the tag i got with them, it just said hybred lilly. Any and all advice suggestions will get super helpful!! I think these are so pretty and i would LOVE to be able to enjoy them for years to come and just want to make sure they get a decent start. I think i might be over thinking and worring about them, but i don't have a "green thumb" so to say, so i am hoping these will be easy for me to take care of. I am really interested in making my own colors and such as you wrote about in your post here. I had no clue that just rubbing the yellow middles together that you can create a different colors. But for me, that will come a few years down the road because right now i am just worried about getting them planted in a good spot and getting them established. aviannovice, They are easy to grow, because they don't get a lot of diseases like some plants. You should try them. You'll never be sorry, since they bloom year and years and the bulbs aren't that expensive. Thanks for reading. These sounds so wonderful and colorful. I might get a few and try them out. Trish, I haven't ever heard about the lilies being dangerous to cats. I have lots of them planted here and the cat just never went near them and she hung around the garden all the time. I'd do more research before giving up on the lilies. Thanks for reading my hub. I love lilies, but I understand that they are dangerous to cats ~ and we have a cat, so I have to stop planting these beautiful flowers.